FOR A BOOKING OF 5 TO MAX. 8 PEOPLE / OBJECT NUMBER 2751225. During the careful renovation of the stone house, we have taken care to preserve the original architecture. 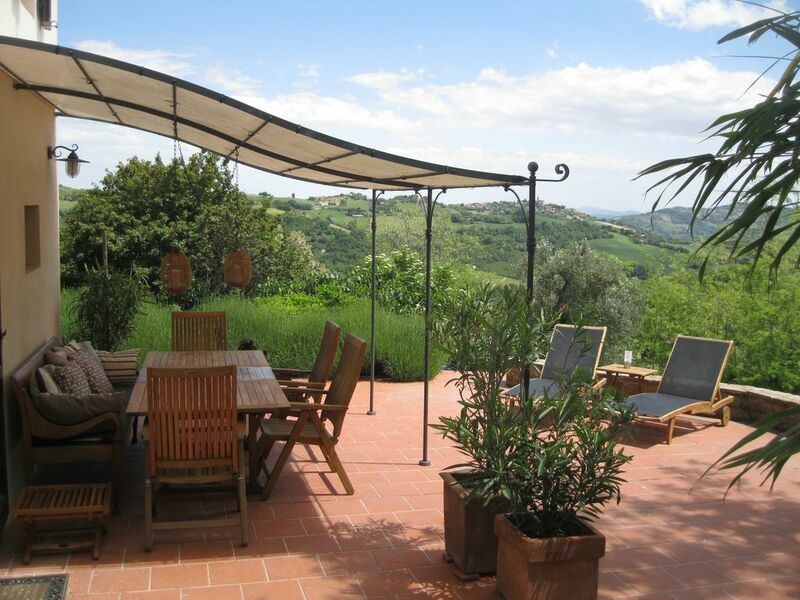 The house enjoys, located on the 1800 m2 of land, surrounded by fields, a wonderfully quiet location with stunning views. However, it has also the advantage of being able to reach the place with a restaurant and small supermarket in 5 minutes. A holiday home ideal for families. Feel comfortable in our Rustico. On 2 floors we have 4 bedrooms and 2 bathrooms. You like to cook, not a problem in our well-equipped kitchen on the first floor. Make yourself comfortable in the living room on the ground floor. Enjoy the culinary delights of Italy in the shade of the pergola on the terrace or in the spacious living room with an open log fire in the cooler months. There is a pool, turn off in the rest of the large garden and for children a paradise to play and run. Here, everyone finds their favorite spot! More pictures and information is available on request very happy! The bathroom on the ground floor is equipped with washing machine. Towels can be provided for a fee. There are fly screens on all windows. A note to the pool - we have a relatively small pool (depth 1,20m - diameter 4.50), which is nevertheless guaranteed a great fun and always appreciated for refreshments. The house is mordernt with all the amenities you can imagine. an amazing lovely patio where you sit comfortably and eat or you can choose to lie in the sun. pool that used always very clean and fresch Frans our own pool guy came and looked at this several times a week. I really recomend to eat up in the village on the restaurant La Locanda dei Ribelli fantastic Italian food and incredibly friendly staff. Something that we appreciated was the brochure that we had been sent to us by the landlord, it was widely used to find around the region. we have been holidaying for many years in Italy, this house definitely end up in the top, I will definitely choose to stay here next time we will visit Marche. Now I was about to forget the internet works great just to buy accses at the little shop in the village. This place is a delight with a restauration and a decoration perfectly done, with love and taste. We enjoyed every single day of our stay there. The owners have thought of all the details and needs and give useful informations on the neighborhood. The terrace is perfect for breakfast and meals with a nice view on the countryside. The region around is really worth visiting, full of treasures in terms of art, historical building, great food and wines. A place to recommend highly ! das können wir wirklich für unseren Urlaub im Juni 2017 in diesem wunderschönen Ferienhaus sagen. Das einstige Landhaus ist mit sehr viel Liebe von den Eigentümern restauriert worden, die Symbiose zwischen den modernen Elementen und der vorhanden Baustruktur ist sehr gelungen. Man fühlt sich von Anfang an sehr wohl…. diese Ruhe… nur die Natur… einfach fantastisch. Das Anwesen bittet die Möglichkeit, dass man sich zurückziehen kann oder auch das man in Gruppe (wir waren 7 Personen) gemütliche Abende auf der Terrasse verbringen kann. Die sehr gute Informationsbroschüre angefangen bei der Anfahrtsbeschreibung über wichtige Aspekte zum Haus und die Gegend bis hin zu Ausflügen / Restaurantempfehlungen der Eigentümer runden den sehr positiven Gesamteindruck perfekt ab. Von unserer Seite ganz klar ein fünf Sterne plus Domizil. We had a wonderful stay with our family of 5 adults and one child. The house is perfect for 2 families. It is really nice to have al the standard things in the kitchen, like Salt, pepper, spices, dishwasher tablets, etc, it makes life easy. The house is very beautiful renovated and the decoration is very stylish. The garden and space around the house is also beautiful. We were there only for a long weekend, but it felt like a week. We would definitely go back again. In famiglia, abbiamo trascorso sei giorni in questa splendida casa, in un paesaggio magnifico. Struttura e posizione davvero uniche, la casa è perfino migliore di come viene descritta: il sapiente recupero dell'ambiente originario è visibile in ogni dettaglio, tutto funziona alla perfezione e ne siamo stati attenti custodi con piacere e naturalezza (unico neo: l'assenza del bidet, seppur in bagni molto curati). La pace e la tranquillità che si respira in ogni angolo sono assolutamente impagabili. Buona posizione per andare alla scoperta delle Marche. The 'brands' offer a variety of possibilities. The culture lovers can start from Mergo such trips. B. to Urbino, Jesi, Ascoli Piceno, Assisi or Gubbio. A worthwhile visit are the many medieval villages in the vicinity. Old city walls, shady narrow streets, arcades and small sleepy village greens provide much original Italian flair. The active people find to a lot of hiking possibilities eg. As the Natural Park 'Golla della Rossa', on the coast of Monte Conero and the Sibillini Mountains. Secondly, the region also offers excellent for mountain bike or road bike drive on. Those looking for the proximity to the water, place in the 40 km distant Senigallia a typical Adriatic beach with shallow water ideal for children. A scenic highlight of the bays of Monte Conero with turquoise, clear water. Or also the dam 'Lago di Cingoli' and a large water park in Apiro. Discover for yourself! Bitte beachten Sie folgendes: Wir haben Pauschal-Mietpreise, abhängig von der Anzahl der Gäste!! Bei diesem Inserat gilt der Mietpreis für eine maximale Belegung von bis zu 4 Personen. Fragen Sie uns nach einem Nachlass bei einer Belegung von nur 2 Personen - möglich außerhalb der Ferienzeiten. Wird das Haus von mehr als 4 Personen bis max. 8 Personen gebucht nutzen Sie unser Inserat Objekt Nr. 2751225. Bettwäsche/Handtücher sind nicht im Mietpreis enthalten! Auf Wunsch können wir Ihnen diesen Service gegen eine zusätzliche Gebühr von 10.- € pro Person gerne anbieten. .